Users of Rain Bird's ESP-Me, ESP-TM2, and ST8-WiFi irrigation controllers with WiFi access can now control their systems with Amazon's popular personal assistant, Alexa. 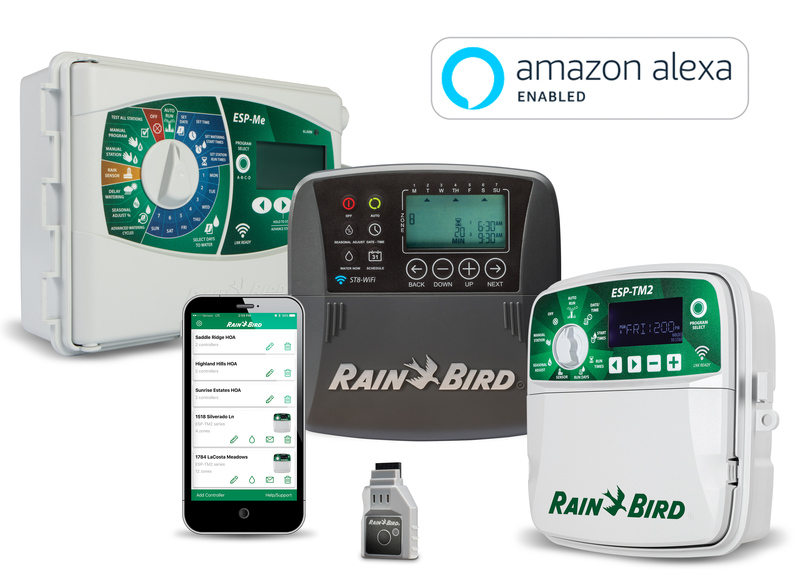 Users of Rain Bird controllers featuring the company's LNK WiFi Module can now "talk" to their irrigation systems, thanks to Amazon's popular voice-activated personal assistant, Alexa. "Enabling Alexa opens up a whole new world for customers using our WiFi-enabled controllers," said Nick Kelsch, senior product manager for Rain Bird controllers. "Now, homeowners can manage their irrigation systems with simple verbal commands. And with 130 commands available, Rain Bird is changing what you can ask of your irrigation controller." In the U.S. and Canada, Alexa commands can now be used with Rain Bird's professional series controllers, the ESP-TM2, and ESP-Me, when outfitted with a LNK WiFi Module, as well as with ST8-WiFi controllers offered through retail channels. International availability is being planned for a future release. After installing the free Rain Bird App on an Android or iOS smart phone or tablet, new users simply need to enable Amazon Alexa within the Rain Bird App settings and log into their Amazon Alexa account to enable the new Rain Bird Skill. The Rain Bird App allows users to give watering programs and zones unique names of their own choosing. They can also request local weather forecasts and manage their rain sensors. "Personalization is key for us, which is why we wanted to ensure that we can provide both custom program and zone names that mean something to our customers," said Randy Montgomery, Rain Bird engineering manager. "Saying, 'Ask Rain Bird to water the front yard' is much more intuitive than saying, 'Ask Rain Bird to water Zone 4.'" To learn more about Rain Bird's complete line of irrigation system components, visit http://www.rainbird.com, contact your nearest distributor or contractor, or call 1-800-RAIN BIRD. Users of Rain Bird's WiFi-enabled controllers can now enjoy the benefits of voice-activated irrigation control with Amazon's Alexa.